Project plans help you plan and execute projects across multiple teams. As projects grow in complexity and scope, it becomes more and more vital to have a good project plan so everyone stays on the same page. 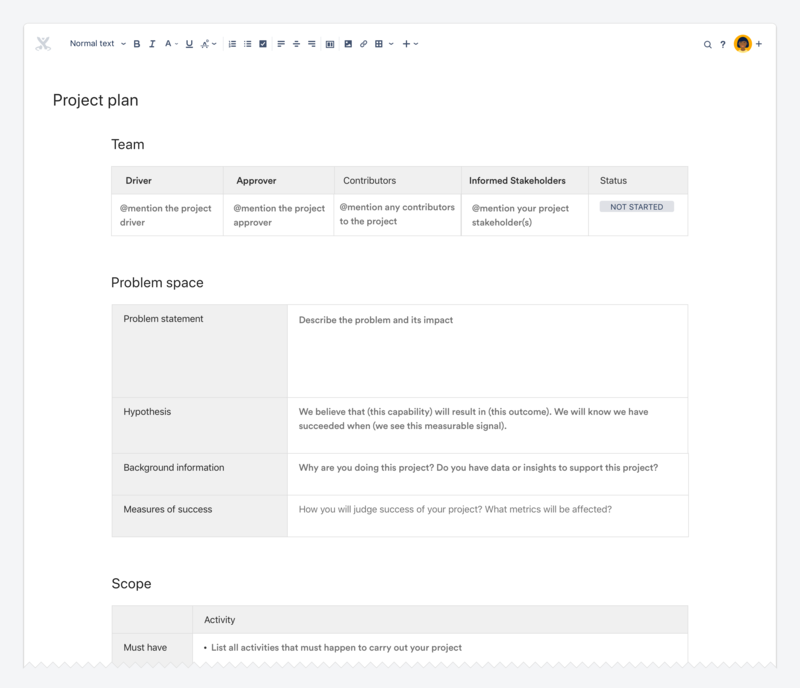 Use the project plan template in Confluence to make sure you don't miss any important details. Define the problem space and scope, track budget and spending, and keep an eye on upcoming deadlines. The template even includes hints and tips that conveniently disappear when you start writing. Select Project plan, then tap Next. Tap Create and add info about your project. Add as much information as you can to the project plan and highlight anything that needs discussion. After you've filled out the template to the best of your ability, host a quick project kick-off to review your plan with stakeholders and finalize scope and deadlines. Use your project plan as a source of truth to guide work as it progresses. Stay on top of costs and deadlines, and add links to design docs, decisions, and other resources so it's easy for everyone to find what they need. Review your project plan and use it to inform retros and help you plan your next project. You can even use your plan to write a wrap-up post detailing the ways the project was and wasn't successful and what you learned along the way. Project plans are created from a blueprint template, which means they come bundled with Confluence and are available across your whole site. Blueprint templates can be customized for each space, and the site admin can even change the default blueprint template for your whole site. To learn more about customizing blueprint templates or creating your own templates, see Blueprints and user-created templates.